There are certain foods that I seem to always stash mass quantities of in my pantry and freezer. I have jars of many kinds of beans and grains, cans of beans and coconut milk, boxes of Pomi tomatoes, and enough varieties of nuts in my freezer to keep a family of squirrels content and well-fed through more than one winter. I am also especially attracted to bags of cranberries--bags of both fresh and frozen end up in stacks in my tiny freezer. I am not sure if it is the bright scarlet color that attracts me, more likely it is the fact that they get harder to find and more expensive during the spring and summer so I fear I will be without them. And really, can you ever predict when you might have an urgent cranberry need? Or perhaps even a cranberry emergency...? This versatile scarlet-hued Cranberry Syrup is a delicious vehicle for using up some of those excess bags of cranberries. It's easy to make, great to have on hand in your fridge for a festive dessert topping or a drink mixer. Mix it with soda or ginger ale for the kids, teetotalers and designated drivers. 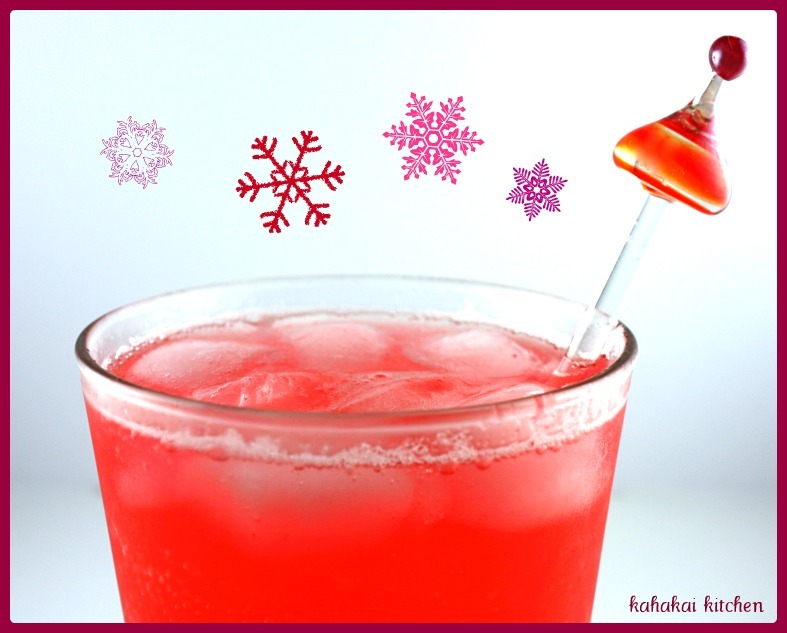 Add some vanilla vodka to that soda for a signature holiday drink, or some vodka and Cointreau for a festive Cranberry Cosmo. (It will impress your friends much more to have a little pitcher of homemade cranberry syrup on the bar than dragging out the big plastic jug of Ocean Spray!) Top a small jar with a bow and add a tag with some serving suggestions and it makes a great little hostess gift, party favor, or part of a gift basket. The possibilities are endless. From Apples for Jam by Tessa Kiros, this Cranberry Syrup is perfect for A Study in Scarlet, which just happens to be our I Heart Cooking Clubs theme this week.I made a double batch of the syrup and following Tessa's suggestion, left half as the thinner sauce which has made some refreshing cranberry sodas. The remainder I cooked down to thicken and served it over a Belgian waffle base, topped with vanilla-bean ice cream for a pretty holiday dessert. Tessa Kiros says, "Here are two ways to make a cranberry syrup: one for drinking with ice and the other for drizzling over vanilla or mango ice cream. This second version is also good drizzled over pancakes or waffles, with some whipped cream or vanilla ice cream. I love starting from scratch with this type of thing--it really makes me feel as if I am doing something special. Add more or less sugar according to your personal taste, and you can use fresh or frozen cranberries. I like to use vanilla-infused superfine sugar if I have some in the cupboard." Rinse the cranberries well. Put them in a deep nonaluminum bowl, sprinkle the sugar over the top and squish it through your fingers to break up the cranberries (children might like to help you with this). Pour in 1/2 cup of just-boiled water and leave it to mingle for a bit. Crush the cranberries more now with a wooden spoon (or a potato masher works well). Strain through a sieve that is fine enough to eliminate all of the seeds and skins, pressing down with your wooden spoon to extract all of the juice. Cool completely, then chill. Pour into glasses and top up with as much sparkling water or still water as you like and a few ice cubes, or even just ice cubes, depending on how strong you like it. 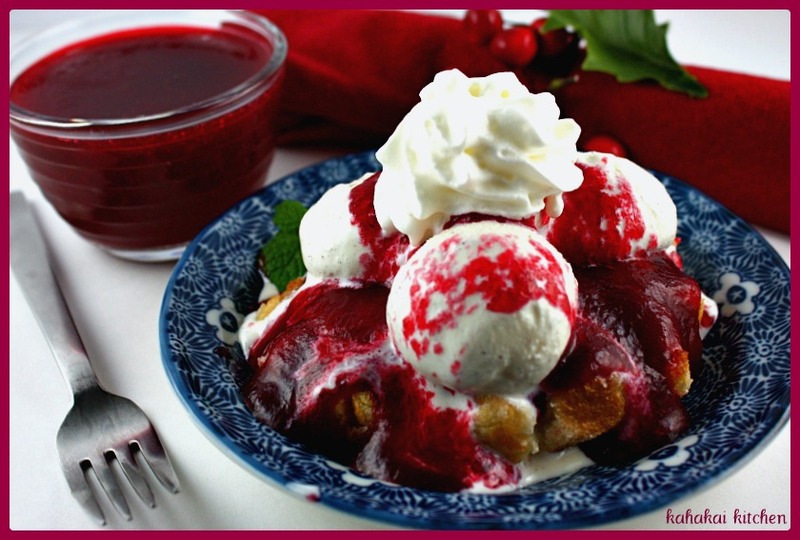 For a thicker syrup to serve over ice cream, put the cranberry syrup into a small pan and simmer over medium heat until it reduces and thickens. If necessary, skim the surface with a slotted spoon to remove any foam. The syrup will turn ruby red and cling a little to the spoon. Cool completely. Notes/Results: An excellent combination of sweet and tart.The vanilla softens and rounds out the flavor so if you don't have vanilla sugar, just add some vanilla extract to the mixture. 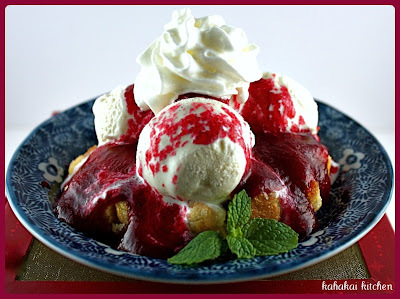 The thickened mixture was really delicious over the crunchy sweet Belgian waffle and vanilla ice cream--with fruit and a waffle you can even pretend it's breakfast! (Not that I am saying I did...) The thinner version is very refreshing with the fizzy soda water and ice but since I reduced the sugar slightly in mine, I actually thought it tasted even better mixed into ginger ale with its slight added sweetness. Super easy and delicious, I can see a few more bags of my precious hoard of cranberries (the ones that aren't going to make this Cranberry Sorbet), being made into syrup. You can check out the red-hued dishes that the other IHCC participants created for A Study in Scarlet by going to the post and following the links. I also stockpile cranberries...and canned pumpkin. This syrup is definitely necessary! I think it would be great over greek yogurt! Oh! Drinking and drizzling are a couple of my favorite things! I like the cranberry syrup/ginger ale mix. Ginger ale doesn't get enough press as far as I'm concerned. Great choice for this week's theme--very vibrant and seasonal-lookng. I've been hoarding cranberries in my freezer too, ever since I made the sorbet. I obviously need to give this a try. I love the syrup and I just included your pomesake cocktail in a recent post (two years ago). That had meant a lot to me. I never have less than 7 bags in my freezer! What a perfect thing to make for our red theme! 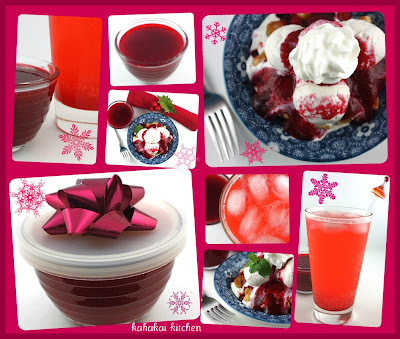 I love cranberries too - and I love how versatile this syrup is. I agree---this would make a great holiday gift! I'm a big cranberry lover as well. Yes, the color is gorgeous, but I also like the tartness you get even when you add sugar. It's always there so you get this tart/sweet taste - love it! Both of these syrups are great! The cocktail with the simple syrup and sparkling water would make a great cocktail with a splash of vodka and touch of lime. :) Love the thicker syrup as well!